At 9 o'clock my Darling Wife will say, "I can hear my pillow calling." And she means it. Try as I have over the 22 years we've been married (and even for the several years we dated), it is a rare event for her to be awake past 10 PM and about as rare as a blue moon that she'll be up after 11. Yes, she grew up in New Orleans, a city famous in part because our bars never close. Somehow the gene that makes us able to stay up all night is not a part of her DNA. In contrast, I used to routinely see 2 AM and sometimes saw the sunrise without having gone to sleep. I used to get a "second wind" at 10 or 11 that kept me going until the music ended or I had no more money for beer. I'm afraid I'm not much better than my Darling Wife nowadays. I blame age and the pressures of work. I can still function on 5 hours of sleep but I find I need at least 7 to have a good day. And so we hit the hay earlier and earlier each year. We're just too tired--or perhaps we're two tired--to stay up late. But I'm not complaining. We have a comfortable bed and two cats who are also eager to curl up and sleep. On cool evenings like tonight, we have a window open so I can hear the slumbering noises of New Orleans as I fall to sleep. I also hear the motorcycles and the loud car radios of those who have not yet succumbed to the onslaught of age yet. Peace be upon them and everyone in the city tonight. In February of 2008, Senator and presidential candidate Barrack Obama visited New Orleans during his whistle-stop campaign of "Hope." As he visits New Orleans today for the first time as POTUS, here is what I would like to hear from him today: vision. It’s a pretty straightforward proposition as I see it. As a candidate for and now incumbent president, I did not/do not expect Mr. Obama to have all the answers. I do not expect him to have all the cures. I expect him to have vision. I expect the Chief Executive to have a concept of what he thinks this land of liberty must look like, and to communicate that idea to citizens, and to inspire us to willingly join in making that dream into reality. When he visited here 20 months ago, Mr. Obama’s vision for New Orleans was potent: “never again,” he said. Think about how much is said with those two small words. “Never again” is a vision for action. It is a vision for prosperity and purpose. It is the vision we need in New Orleans, in coastal Louisiana, and in a nation with so many basic needs that are ignored for convenience. No, Mr. Obama will not grab a shovel and start digging the clay to fortify our levees. He will not pull the levers on the pile-driving rig to push sheet pile into the ground. He won’t even pull out his Diner’s Club card and pay for the astounding amount of work that needs to be done to protect our great city. What I would hope to hear from the president today when he visits New Orleans is a clear statement of his vision. Another president, speaking about another daunting goal, articulated his vision by acknowledging the difficulty in achieving the goals he had set out for the nation. He told Americans quite plainly that we would strive for lofty goals, "not because they are easy, but because they are hard, because that goal will serve to organize and measure the best of our energies and skills, because that challenge is one that we are willing to accept, one we are unwilling to postpone, and one which we intend to win, and the others, too." Since ascending to the office, the president has not to my knowledge repeated those words or anything else that establishes his vision for New Orleans. That’s what we need from Mr. Obama today. I think I was in high school before I discovered how ridiculously mangled my pronunciation of mirliton was. It was in the middle of a conversation about who-can-possibly-recall that I said it, which completely derailed my geeky friend, Anthony. "We ate mellytawns from my grandmother's back yard," I repeated. His crumpled face was probably a reflection of the data logjam in his brain and I waited while he closed his eyes and struggled to untangle my words into something he could recognize. I would have not at all been surprised had he blurted, "That does not compute!" in a robotic monotone. Of course, at first I did not know what I had said that has seized him so. It actually took a few moments for him to parse my statement down to the single word at issue and for him to communicate this back to me. Finally, he brightened with resolution. "Oh, you mean mirliton!" Again I repeated it the way I had always pronounced it, the way I had always heard it, the only way I knew to refer to the water-laden, spiny green vegetable that my grandmother served baked and filled with stuffing. Again my friend corrected me, telling me how it was spelled and urging me to look it up in a dictionary. Well, I did look it up, and sure enough I discovered that my friend and my dictionary were both wrong! I thought of this silly moment in my life again when I heard that it's almost time for this year's Mirliton Festival. 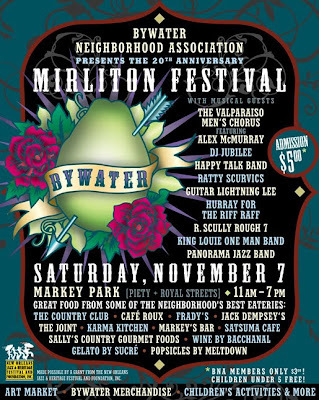 It's coming on Saturday, November 7 at Markey Park in Bywater. Bands, art and of course, lots of local food including some featuring that funny little mellytawn that as far as I can tell only shows up on tables in New Orleans. All are invited, but if you see my old friend Anthony, be careful what you say.